In an in-person interview. You may know their existing product line – Analyze, Coach, Alert and Redact. They improve sales performance, measure effectiveness of marketing campaigns, call center efficiency, etc. They recently announced Visualize – this adds on to Analyze – with a new partnership with Tableau, they can drive discovery and the presentation of results of speech analytics. “It is far more than a presentation tool. The real value point here is getting more eyeballs on the data. Beyond the contact center” said Steve Chirokas, Director of Product & Channel Marketing. “When management and CX Pro have this data, it really drives change,” exclaimed Steve. “It’s a graphical presentation on steroids,” he added. “This is a high-fidelity, high-quality audio capture solution fueling speech analytics,” said Steve. Solution Pack is also new and is a package solution for identifying key attributes of the customer experience. “It’s the meaning of how people express themselves – not just what they say but how they say it. Advocacy, empathy and more. They immediately get directional insight with scoring. This makes the contact center resources much more valuable throughout the organization explained Steve. We provide this packaged content – in other spaces like customer service as well. It allows our customers to be up and running in ten days said Steve. This is as opposed to ten weeks for many of our competitors they told us. CmX Quality measures effectiveness, effort and emotion and CmX Loyalty measures retention, advocacy and enrichment. By enrichment – they mean they can determine agent engagement – explaining how the product works, feature dissemination, etc. They capture the way you speak which is different than the way you write they explained. That’s how we help customer get started. 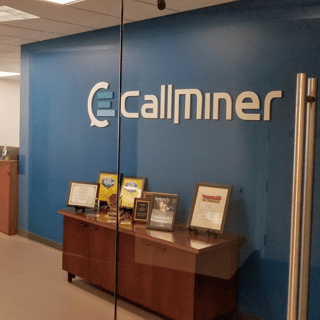 The future for CallMiner is simplifying this insight, and leveraging advancements in AI and machine learning. They want to surface insights allowing companies to focus on change. The company is gaining momentum with growth in customers, employees and partners.